We feel that being able to speak Mandarin was one of the biggest reasons our older adopted daughter transitioned so well into our family. (Let me clarify…..speaking Mandarin and the grace of God!) We wanted to share with other adoptive families a tool that might make your transitions easier too! 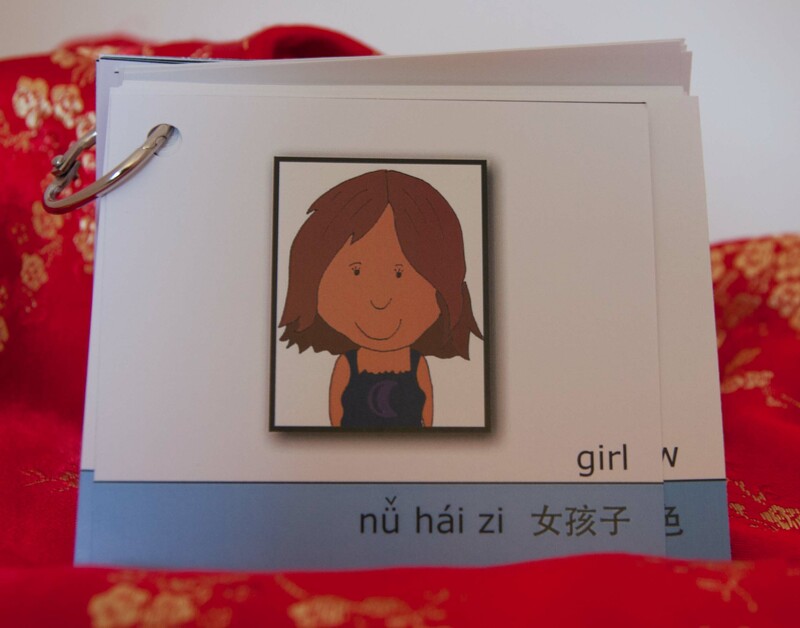 Chinese/English Picture Flashcards: We offer these as a digital download. Each set can be printed on white cardstock and used with an index card ring. The words selected and graphics were drawn with the adoptive child in mind. Each set also includes a simple guide for pronunciation. Set 3 People: boy, girl, friend, doctor, mom, dad, baby, big sister, little sister, big brother, little brother, hand, foot, nose, ear, tongue, head, tummy, eye, mouth, sad, happy, excited, scared, hurt, I love you, walk, play, hold me, swim, bath, sleep, go potty. Set 4 Things: blanket, pillow, bed, bathroom, toilet paper, towel, tooth brush, key, pencil, umbrella, medicine, book, ball, doll, toy, bus, airplane, pants, shirt, jacket, dress, shoes, sock, hat, fish, dog, cat. Please click on the buttons below to order individual card sets. You can order more than one set by clicking ‘continue shopping’ in the shopping cart. One of our favorite parts of China is the food, which, in order to get the good stuff, requires some stepping out of the hotels and willingness to try smaller restaurants that are filled with locals. This menu gives you everything you need to order common food with confidence. We have included our favorite dishes from the time we lived in China. Hope it helps you as you travel and that you fall in love with Chinese food all over again! 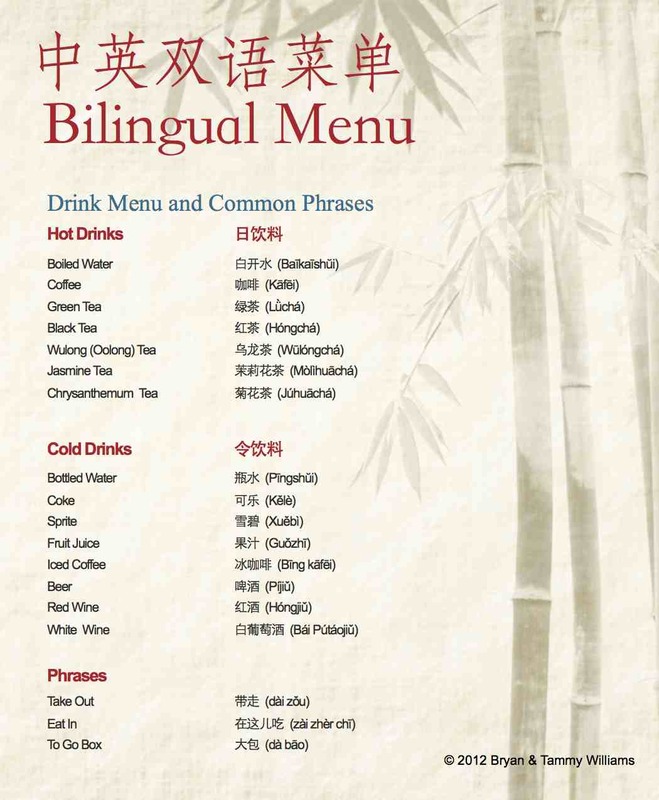 We are offering the menu as digital download PDF files in 2 different formats. The content is the same for both, just the formatting is different. This lets you pick the one that will work best for you. One format is 8.5 X 11 paper. When this is printed double-sided, you can fold it and it will fit perfectly into a book. The second is specially formatted for smartphones, iPad, Kindles, or the like. We have formatted it to allow for less scrolling and improved zooming. You can buy the menu in 1 format for $2 or both formats for $3. Click the Paypal button to purchase. We will email you the download link, once we are notified of your purchase. LOVE these!!! I just placed my order, you are incredibly creative!! If I order this today, about how long until I get it in the mail. Hopefully leaving on 7/20. Do I have time? Shelley, I am happy to get them to you before then. I will send you an email. Congrats on your new little one!! After we process your order, I will send you the download links via email. You will get a total of 4 links…one for each set. Yay!! So excited about these!! I just ordered the digital download of all 4 sets. Can’t wait to get them! how many cards are in each set? If I get the digital download do they print 4 to a sheet? Chantelle, the cards print 6 to an 8.5 by 11 piece of card-stock. Each set has a different amount based on the topic of the set – but roughly each set has 5 or 6 sheets or 30 cards once printed and cut. Thank you for your questions. Let me know if there is any other way I can help. Hi. Just purchased your digital download. Looking forward to using these flash cards in my class. I am trying to figure out when I will get the email to download the flashcards. Just making sure you got the flashcards. Sorry for the delay in getting them to you; our son was in the hospital. Let me know if you had any problems with the links. Thanks again!